The OP505 series devices consist of NPN silicon phototransistors molded in blue tinted epoxy packages. The narrow receiving angle provides excellent on-axis coupling. These devices are 100% production tested using infrared light for close correlation with Optecks GaAs and GaAIAs emitters. OP800A NPN Silicon Phototransistors View TT Electronics. 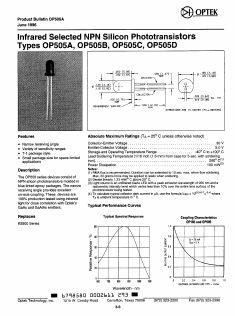 OP508FA NPN Silicon Phototransistors View TT Electronics.